Built for production and sized for cutting work up to 20" wide to the left of the blade and 14" tall, this Heavy-Duty Bandsaw won’t back down to anything less. 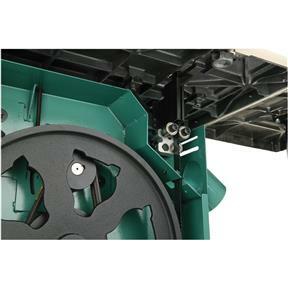 The 5 HP, TEFC motor powers the fully balanced cast iron wheels for smooth operation all day long. Other features like blade tension indicator, micro adjusting tilt table, motor brake and rack and pinion upper guide adjustment make operating functions quick and convenient. CSA certified meeting CSA C22.2 #71.2-10 and UL 987-8 standards! Blade size range: 1/4" - 1-3/8"
Approximate shipping weight: 684 lbs. I have always wanted a larger saw. This one replaced a 18 with a 1.5 hp motor. Doing some semi production resawing this was a major step up for me. The included blade was terrible as others have noted. I ordered resaw blades made for a sawmill and they work a lot better. Very happy with my purchase. I bought this as a gift for my husband. He has not got to use it yet but seems very happy with the product delivered. Only issue was that it was not mentioned in the description (that I saw) about it not coming with a cord or plug. So we had to go and try to find the correct parts to run the saw. It was a little hard to set up the tracking of a one inch carbide tip. I am very impressed with my new Bandsaw. Very well made and works like a charm. This is the fourth item I have ordered from Grizzly and I am still impressed. After doing a lot of research on band saws, this was the clear winner for me. I have bought smaller cheaper machines in the past and they never satisfied my needs, this one not only meets my needs but it surpasses them. So what were the main reasons for this purchase over similar machines? First is the 5 hp. I resaw hard woods often exceeding 12" and the power is amazing. When I am using the saw for lighter cuts the motor really isn't using much more power than a smaller motor so the extra power when you need it is great and it is cost effective when you don't need the power. Second, this saw comes with replaceable " tires" for the wheels which will save me money when it comes time to replace the rubber since I don't have to replace the metal wheels like most machines and yes the tires are crowned for superior tracking. Third, Table size, it is really amazing how much easier things become when you have room to properly support your projects. Those three things were the main differences for me when choosing but not the only reasons, there were many others like the included resaw fence and the great table tilt design. This saw is packed with features with a very nice price point. After receiving this saw and using it a while, I am blown away by the fit and finish, the rock solid smooth running of the wheels and the overall quietness of this machine. It screams industrial quality and you just know you bought a saw you will enjoy for the rest of your life. Q: What is the difference between G0566B and G0531B? A:G0566B is equipped with a 3 HP, 220V, single-phase motor and requires a 20A power supply circuit. G0531B is equipped with a 5 HP, 220V, single-phase motor and requires a 30A power supply circuit. Q: How does the motor brake work? A:Inside the motor is a magnetic braking system that can quickly stop the motor rotation in as little as 3 seconds. The brake is electrically-activated each time the motor is turned OFF. Q: What is the advantage of having double ball-bearing blade guides over singles? A:Double ball-bearing guides don't provide any advantages for 1/2" or smaller blades, but they do provide a much greater level of support for 3/4" and wider blades. 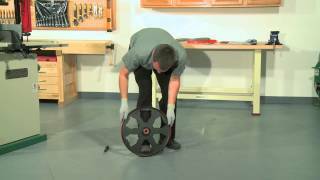 This is important if you're planning on doing a lot of resawing or other straight cutting where a high degree of accuracy is needed. Q: What are the benefits of having a rack-and-pinion table tilt? A:The main benefit is simply ease-of-use and precision adjustability. Without the rack-and-pinion, you would have to muscle the large cast-iron table into a precise position, and then try to hold it in place while you tighten the locks-not an easy task. Another added benefit of this design, however, is the additional stability and support the rack post provides to the back-end of the table. Q: What is the benefit of having cast-iron trunnions over aluminum trunnions? A:Cast-iron trunnions give the table a more solid, robust support system, allowing it to better resist any flexing or twisting that may occur from really heavy workpieces being set on the table, especially on the outside ends of the table around the blade slot. Q: What is the benefit of having a machine equipped with a magnetic switch? A:A magnetic switch offers a couple benefits beyond a typical switch. First, a magnetic switch is equipped with an overload relay that protects the motor from thermal breakdown that occurs if the motor is pushed beyond its limits. Second, in the event of a power outage, tripped circuit breaker, or blown electrical panel fuse, a magnetic switch will not automatically restart the motor when the power supply is restored. Q: What are the pros and cons of Cast Aluminum versus Cast Iron Wheels? A:The heavier mass and weight of cast-iron wheels reduces vibrations and creates a flywheel-effect, which helps the blade maintain a consistent speed during heavy cuts and when resawing. 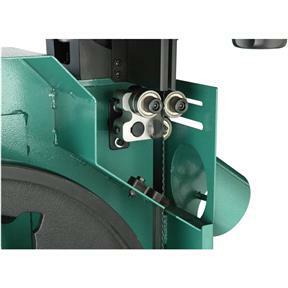 The drawbacks to this added weight and mass are that it requires more energy from the motor to get the wheels and blade up to speed; and unless the saw is equipped with a brake, it also takes longer for the wheels to come to a stop after the saw is turned off. Aluminum wheels, on the other hand, are much lighter and require less time and energy to get up to speed and bring to a stop, which is why they are ideal for many hobby saws and those that will mainly be used for general-purpose rip cuts and crosscuts, such as with 4/4 (1") or thinner stock. Q: What are the differences between ball bearing, block, and disc (a.k.a. "Euro style") guide blocks? A:The main differences between blade guide types can be boiled down to four factors: (1) amount/quality of support, (2) amount of blade friction created from that support, (3) ease of set-up and adjustment, and (4) durability and maintenance frequency. Ball-bearing guides offer the best all-around balance of these four factors. Although they don't provide as much contact area for support as block or disc guides, they do maintain constant contact with the blade without greatly increasing friction. They are also the easiest to set up and tend to be the most durable. Disc guides provide the highest amount of contact area for support, but as with guide blocks, they must be positioned 0.004" away from the blade, which requires some type of gauge to be used for proper set up. Whereas some disc guides are fixed, similar to block guides, our Euro-Style disc guides spin with blade contact, which greatly reduces friction and the need for regular resurfacing. Block guides offer excellent support, but unless they're made from specialized materials to reduce wear or friction, they tend to fall behind the other guide types in all other categories. 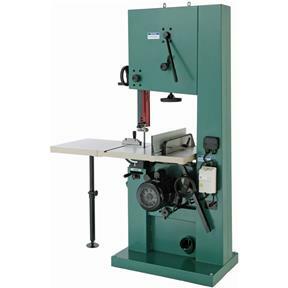 Q: Can a wood bandsaw cut metal or vice versa? A:The proper cutting speed for the majority of ferrous metals is under 300 FPM. The proper cutting speed for the majority of wood cuts is over 3000 FPM. Trying to cut metals on a wood bandsaw--at speeds 10 times faster than they should be--is dangerous and will likely result in a broken blade, damage to the bandsaw, and a really horrible cut. Cutting wood on a metal bandsaw is possible, but it would be tedious and slow, and likely would not produce a decent quality of cut. In addition, bandsaw blades for cutting wood are designed much differently than bandsaw blades for cutting metal. With that said, there are some soft, non-ferrous metals (such as aluminum) that can be cut at around 1500 FPM (if using the correct blade type). Although some of our wood bandsaws operate at approximately this same speed, the other components of these saws weren't designed to handle the metal chips and swarf that would be produced by the cut, which would likely result in minor damage to the machine and void the warranty. The bottom line is this: Always buy the right machine for the job! Q: How do I know what type of blade I should buy? A:Blade choice is typically determined by the type and purpose of cut, the hardness and thickness of wood, and the desired trade-offs between cutting speed vs. cutting quality. In general, a wider blade is preferred for cutting straight lines because the blade tends to wander less, and a narrower blade is preferred for cutting curves because it has a much tighter minimum cutting radius. The two main types of blade teeth are "Hook" and "Raker". Hook teeth tend to cut faster and leave rougher results, while Raker teeth tend to cut slower and leave smoother results. There are additional types of teeth, such as Skip, Positive Claw, or AS-S, that are essentially modified versions of the Hook or Raker tooth shapes, but with slight changes to the cutting angle, gullet-to-tooth ratio, tooth set, etc. to provide unique advantages for special types of cuts. Q: What type of blade do I need for resawing? A:Generally speaking, you'll want to use a wide blade (1/2" or larger) with "Hook" style teeth (or "Positive Claw" on Timberwolf blades) and a low number of teeth per inch (TPI). A wide blade helps ensure cuts are straight and the Hook style teeth have large gullets for removing material as the blade passes through the workpiece. Q: Which saw is best for resawing? 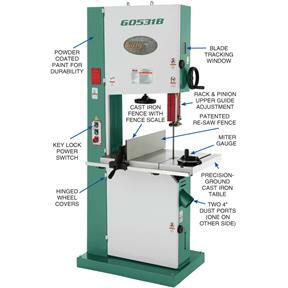 A:The key specs for resawing are the maximum cutting height and a larger motor size. Due to the amount of material being cut at one time, resawing puts a lot more strain on the motor than other types of cuts, so generally speaking, the more power the better. If you're using the proper blade type (a hook-type blade with few TPI) and a modest feed speed, you can get by making the occasional rip cut using a 1 HP-2 HP motor. Otherwise, if you plan on making regular resawing cuts, you'll get the best results with a 3 HP or larger motor. Q: My bandsaw blade came with a tag on it that said "Recommended for cutting wood or soft non-ferrous metal." Does this mean I can cut metal with my wood bandsaw? A:Just because the blade is recommended for both wood and soft, non-ferrous metal (e.g. aluminum, copper, etc. 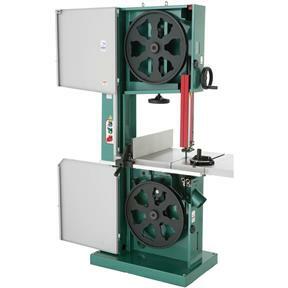 ), it doesn't mean your wood bandsaw is suitable for cutting both types of material. 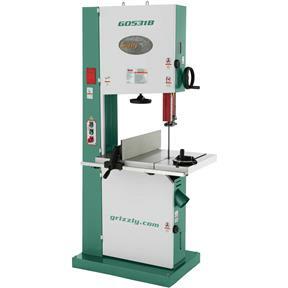 It is important to keep in mind that the blade you bought may also be used on other types of bandsaws, such as our G0640X or G0621X, which are specially designed to cut both wood and metal. 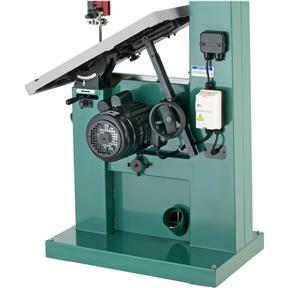 Q: Can I still use my bandsaw without connecting it to a dust collector? A:Yes, this is possible, but we don't recommend it. Without using a dust collector, the dust will quickly pile up in and around your machine, resulting in additional cleaning time later. Besides making a mess, fine dust can be harmful to your respiratory system. 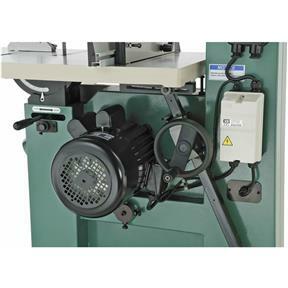 It is a better choice to connect your bandsaw to a properly designed dust collection system that at least pulls the recommended minimum CFM from each dust port on the machine. Q: What is the purpose of the pin that fits in the blade slot opening at the end of the table? A:All bandsaw tables are inherently weaker on the outside half of the table. This is due to the slotted opening that allows the blade to pass through the table during blade changes. The table pin helps reinforce the two sides of the table around this slot, so they remain aligned with each other and keep the table flat. For this reason, it is extremely important to always keep the table pin firmly installed, unless you're changing blades.